At 9am on Sunday morning New York City feels strangely quiet for once, but as I round the corner to Foley Square, just steps away from the Brooklyn Bridge, I am greeted by upbeat pop music and the enthusiastic chatter of hundreds of people who have come together for an important cause. 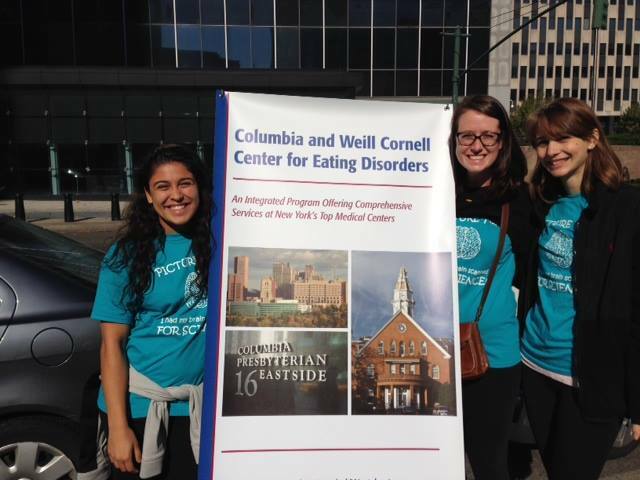 Yesterday, October 5th, marked the 6th annual NYC National Eating Disorders Association (NEDA) Walk and the team from the Columbia and Weill Cornell Centers for Eating Disorders were delighted to take part. Started in 2009, NEDA Walks aim to promote eating disorder awareness and raise funds to support programs and services related to eating disorder prevention, treatment, and education. The NYC Walk is just one of approximately 50 national walks occurring throughout the year. In six years, these walks have raised over 2 million dollars combined. This year at the NYC Walk, the top individual fundraiser alone raised over $6,000 and the top team over $11,000—amounts that no doubt will help support NEDA’s impressive efforts. But, while fundraising is an integral aspect of NEDA Walks, it isn’t the only essential element. This year, I was particularly struck by the range of individuals that the NYC NEDA Walk unites for its cause: men and women of all ages and races, from those who have been personally affected by an eating disorder to their loved ones and treatment providers. The array of advocates for the advancement of eating disorder prevention, treatment, and education efforts not only serves to remind us that eating disorders cut across demographic divides, it also sends a hopeful message: that more and more men, women, children, and teens from all backgrounds are eager to join together in the fight against these dangerous conditions. NEDA Walks are one example of a growing body of eating disorder advocacy work occurring throughout the country. Less than a week before the NYC NEDA Walk, the inaugural March Against Eating Disorders took its first steps in Washington, DC on September 30th. Those who could not march in-person were encouraged to join the event virtually through Twitter and Facebook, demonstrating that social media makes it easier than ever for people from across the country to band together for a shared purpose. Between those in DC and those on the web, more than 600 people participated in this day. Last month also highlighted that advocacy efforts really can pay off. On September 23rd, New York’s Governor Cuomo signed legislation to create the Eating Disorders Awareness and Prevention Program within the New York State Department of Health. This program, recognizing the importance of early detection of eating disorders, aims to increase awareness of the signs and symptoms of these illnesses and promote available resources and services to individuals who are struggling so that patients can more easily get the help that they need. Passing this bill into law required the hard work and dedication of legislators and constituents alike, affirming that together we can create real change. Find a NEDA Walk near you, or organize your own! See how your voice can make a difference—contact your legislators! Currently a student? Get involved in your school’s eating disorder initiatives. If they don’t exist yet, consider starting the conversation yourself! Tags: advocacy, outreach, prevention, recovery, treatment. Bookmark the permalink.